A round trip exploring the Cadorna Line, a system of military fortifications dating back to the First World War which was to defend the northern boundary of Italy with Switzerland. The route also includes important evidence of popular religion. 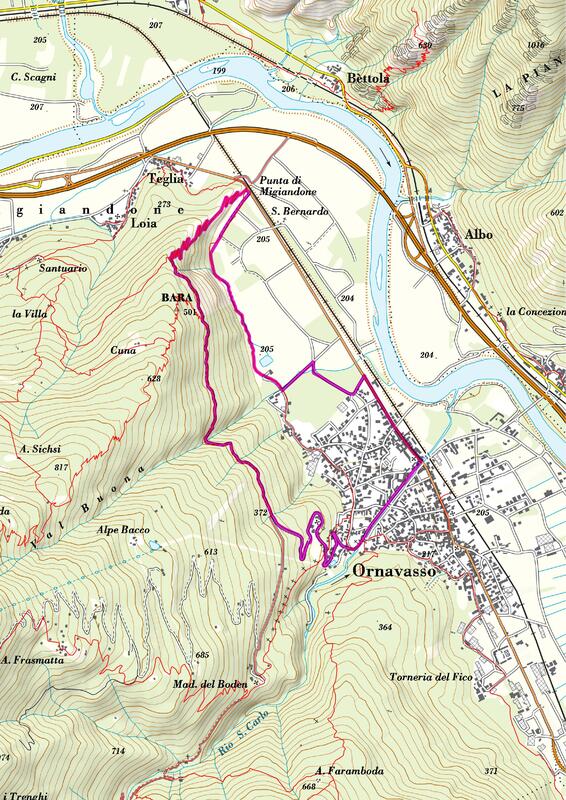 The itinerary starts in Ornavasso. Passing along the left bank of the San Carlo River looking downstream you cross the centre and come to via Gasse. At this point you begin to climb the road to the Santuario della Madonna del Boden (Sanctuary of Our Lady of Boden). After passing the beautiful parish church built with local marble, you skirt the Madonna della Guardia (Our Lady of the Watchtower) with the old tower until you reach the bend of the ancient marble quarry of Boden which provided stone for the construction of Milan Cathedral. Here the level military road, level leads to the Forte di Bara (Bara Fort), defensive works which are part of the Cadorna Line, consisting of a series of emplacements supported by stone walls and main barrier of the Stretta di Migiandone (Migiandone bottleneck), the narrowest part of the Toce valley and main access route from the lakes to passes of Ossola. From the Forte di Bara (Bara Fort) you go down the military mule track and come to the bottom of the valley in a large square which contains two large cannons. From here, along the cycle and pedestrian path, you come to the Laghetto delle Rose and then return to the centre of Ornavasso.